Only a few weeks ago I decided to enrol in the Year 13 program with Youthworks, where I hope to build a solid structure in my faith and theology while learning and serving alongside other high school graduates. Like our other Year 13 student Liana, I’ll also be helping out at Oak Flats Anglican, and I will be leading in Kids’ Club, CHAOS youth, Sunday morning kids, plus teaching Year 7 Scripture at Oak Flats High. This year, I’d love you to pray for me, especially that in this new season of life I might become accustomed to the new ways and focus on the year ahead with God in mind. One of the things I’m most looking forward to is the month-long mission trip to Fiji in June. 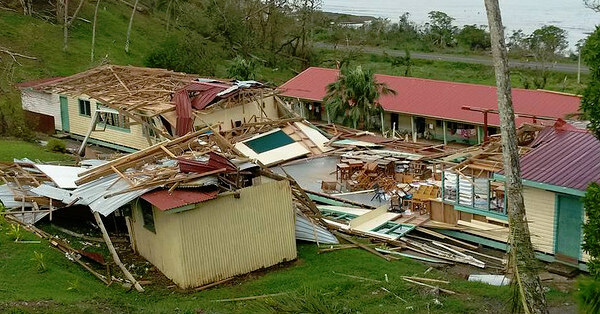 Unfortunately, Fiji has just suffered one of the most violent cyclones in history, and right now, people are trying desperately to rebuild their lives. One of the villages we are planning to visit, has only 6 of the 35 houses still standing. When I went to my Year 13 lectures this week, the staff told us to pray for the Fijians. They said that whilst the Fijians are praising God that they are alive, they ask us to pray for the many people who are still unaccounted for. Some of the Year 13 staff are fearing the worst for those people, especially as they had grown so close in friendship with many who are missing. They asked us to encourage the people in our church to give financially to practically assist the people of Fiji in their recovery. The best way to do this is through Anglican Aid. You can give directly to them by visiting www.anglicanaid.org.au or phoning 9284 1406. Please keep praying for Year 13 students like me, and especially pray at this time for Fiji as they seek to rebuild their lives after this tragic natural disaster.